In the 80’s, I recall finding adorable, black, high-top, lace-up boots that were made in 11’s but the store wouldn’t stock them. They always had some lame excuse for not ordering them. So, I wrote the manufacturer directly. I dipped my foot in red paint, pressed my mammoth footprint on a page, and typed around it a pleading request to send me their boot in that elusive size 11. I was a desperate woman, emotionally and physically distraught! Today, however, there are options! It’s called DesignerShoes.com, and that’s no small feat (literally)! Imagine what it must have taken to pull this fabulous collection of shoes off for us. Thanks to a weary friend, who was tired of hearing my plight for housing my feet attractively, I googled “BIG SHOES FOR WOMEN.” I will never lack again, thanks to DesignerShoes! Long toes, high arches, bad sizing? Please help! My foot measures 10.5″ long and 3.75″ wide using the methods suggested on your website. For everyday footwear (athletic shoes, snow boots, etc) I am comfortable in a size 12 USA (tag category size 12) , or a EURO 43 in mens clogs, etc. However, when it comes to ordering heels , I am at a complete loss! For most of my life, I have been buying a size 11 USA, and just smooshing my feet into them (this doesn’t work well, and they are horribly painful within a short period of time) mostly because that is what is available without ordering special sizes. However, recently I have decided to update my shoe collection and would like to buy some heels that ACTUALLY fit me! But, what I discovering is I don’t know what size that is! If I order a size 12 USA in a heel, my feet have plenty of room, but quite quickly I get a painful sensation in my big toe, with a lot of pressure up towards the toe nail…I assumed this was because my feet were wide, so I ordered some 12 W shoes, and I can’t keep them on my feet! There is also about an inch of space between my heel and the back of the shoe, and my foot slides easily into the front of the shoe, making walking difficult. However, after measuring my foot I see that I am close to a narrow?! This surprises me as I was thinking ordering an 11W would be the next thing to try! I also have long toes, with my second toe being the longest point on my foot with pretty high arches. I would really appreciate advice on sizes to try…I am not sure if I am wearing the wrong size shoes or if I should be trying to correct with inserts, pads, etc. Thank you so much in advance for any advice!! I’m sure you’ve been told that having a second toe longer than your big toe is a sign of intelligence? You will need it to figure out this problem. It is all about the toes. Although the rest of the population gets to pretend that shoes are designed by the length of your foot from heel to toe, you, my dear, must face up to the hard cold fact that shoes are really designed based on the measurement from the heel to the ball of your foot. Shoe designers assume the toes are normal length. So if your shoes are extra short or extra long, there is trouble. Your best bet is to go into a shoe store that measures feet with what is called a Brannock device. This device measures from your heel to the ball of your foot and tells you your true size. I’m going to assume that you probably really are a size 11 or an 11.5 from the ball of your foot to your heel. The inch of space you say you have between your heel and the back of your shoe worries me, though. This suggests your foot might even be shorter, like a size 10. 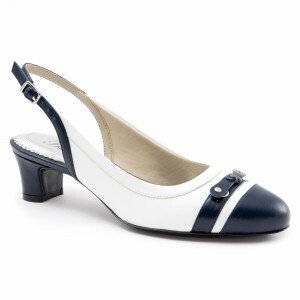 Whether you are a size 10N or a size 11N, you will need to pick your pumps based on style. 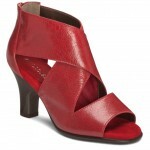 You will probably do best with open toe pumps and sandals. Search on DesignerShoes.com for “peep toe” or “open toe”. You may find closed toe pumps that are longer to fit your toes but to keep them on, look for a “mary jane” style strap over the arch of your foot. You are not going to find a perfect size that always fits because the style and shape of the shoe is so important to you. Sorry. But I know your superior intelligence will help you rise above this small frustration in life. My feet are abnormally wide. I can never find the right shoe size. I am a 11.5 wide and I can never find shoes that look good on my feet, like dressy shoes and tennis shoes. Please help. ASAP. My Dear ASAP! Cute name! I too am a women’s size 11.5 and I can tell you, very few places make these sizes. So you need to learn how to think more flexibly about buying by size. First, some homework. Read this: http://www.designershoes.com/about-size/size. Shoe sizing, when it comes down to hundreds of different manufacturers using hundreds of different factories, can be less than completely precise. And, come to think of it, our feet aren’t exactly precise either. They can change a full size or width between morning and evening on a hot day. Pregnant? Double that. So take 11.5 wide as your base. Then look at your feet. Are they wider in front? Do you need a wide size because they are thicker from top to sole? Do you need a wide size to accommodate bunions? Keep the shape of your feet in mind when you consider shoes. Look at the shape of the shoe. If your feet are squared at the toes, a square toe box will work well, for example. Can’t find anything in 11.5W? Look at 11WW. Look at 12M. But maybe you are saying 11.5W is not fitting correctly. Put all your weight on one foot, standing on a piece of paper. Have someone draw a TIGHT line around the edge of your largest foot. Your foot should be 10.7 inches long and 4.4 inches across the widest width. But be very suspicious of the width. If your foot is thicker (like mine!) you may need to move to a wider width, no matter what the chart says. If you decide to move to a wider size, here’s another problem. Your heel may slip out of the flats or pumps. And, of course, here is the solution. You just can’t wear flats or pumps. You need to look for flats and pumps with a “maryjane” strap or a high vamp so the shoe will stay on your foot, and still fit across the top. Take a look at these size 11.5W styles. And, with a good sense of the shape and thickness of your feet, take a look at these 11WW styles. A shoe that I wear myself! I’d like to buy a pair of shoes in DesignerShoes.com but I’m not sure about the size. The thing is my feet measure 28cm and my size in Europe is 43. What would be the right size to buy in DesignerShoes.com? For me, the more trustful measure is by CM … so, as of the webpage chart, would my size be a 10 / 10.5 in UK measure? According to the chart you would be between a 10.5 and an 11 in UK measurements. Before committing to a shoe I would measure again just to be sure you are getting the same length. If you wore a 43, your foot length would be around 26.7cm. The way shoes are made definitely makes a difference in how the overall fit works. 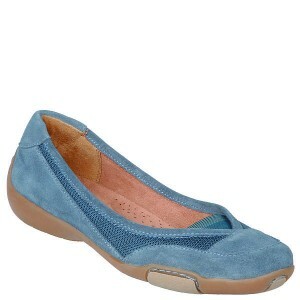 Sometimes one can manage a slightly smaller size if there is less padding in a shoe, such as a ballet flat or a sandal. What you have described is a fairly significant difference, but don’t despair! I would love to know what the results are a second time, and in general what types of size 43 shoes you have been wearing. A: Presently there are no triple wide 11.5 dress shoes. If you need an instant summer workaround, then you might consider buying double wide dressy sandals. This way your feet will have more freedom with less shoe material. When searching for closed-toe shoes remember that restretching them is also a possibility in gaining that perfect fit. Ros Hommerson makes wide width sandals. You may also try ordering a half size larger in order to allow for the increase in shoe space. Jax Silver by Annie could also work because of less enclosed space. When considering a style, remember that your foot shape and thickness are key factors within the context of the shoe shape. Q: I have a long, narrow, foot, with one foot being a full size larger than the other – more like a 12 AAA on one foot and 11 AAA for the other. You told me quite some time ago about the problem you are having with shoe companies eliminating the narrow sizes and your hope to find some that would be more accommodating to the needs of so many of us. Whenever I order 12 N, I literally walk right out of both of the shoes – a lot of the “cute” shoes only go up to 11 M (no narrows) and I’ve ordered some of those, but in every case, have literally “walked right out of both shoes” – to the point where it’s almost a danger for my foot to slip and is a huge effort even to try them out on the carpets! naturally, it doesn’t come in a N in the 12 and even if it did, it would probably be too wide & I’d walk out of it. My question is whether you think an 11N might “work” – not for mall or street walking, but enough so that I could cover my route when I volunteer at the hospital? Open toe shoes are not allowed and I need something that I can not only stand in, but be able to walk throughout the hospital. Sneakers don’t quite “cut it” and in the warm weather, I really like to wear a skirt occasionally and not just slacks all the time, so would like a good-looking, comfortable, shoe that is not “dangerous” for me to wear!!!! I had wondered if the elastic vamp might be of some help in holding the shoes on and if the denim would be a soft enough fabric so that there would be some “give” to the shoe for my longer foot. Will be interested in your opinion. I just handled a similar question. The shoe makers aren’t getting better about this. As for trying an 11N, everytime I have made that kind of compromise myself, I’ve regretted it. If you are walking around a hospital being helpful and your toes are scrunched – you will most likely not be pleasant. You can try it. In some instances it works. But that kind of adjustment in size and width usually works for people with wider, more flaccid feet. I’m guessing yours are nerves and bones. They won’t like to be pushed around into a different shape.